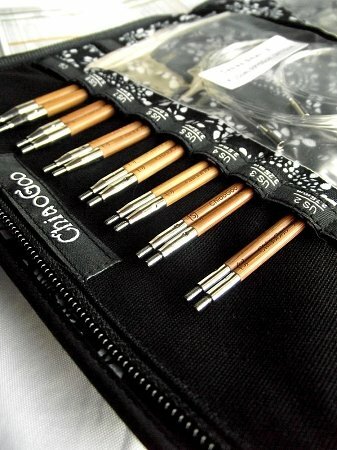 The ChiaoGoo SPIN 5 inch Bamboo Small interchangeable set features the same bamboo needles and nylon cords that you know and love. The needle tips feature a lifeline hole that makes adding a lifeline as simple as knitting across the row. The sets come packaged in an elegant black and white case. The case is compact (6" x 8" closed) with 29 inner pockets for tips and one outside zippered pocket.